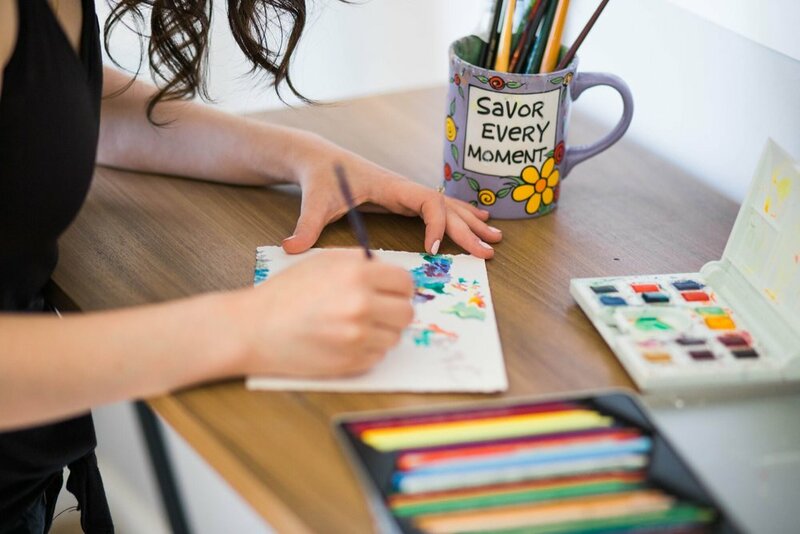 For me, blogging is an exciting and creative way to connect with others around the world, share insight on a variety of topics, and sell artwork. I’ve come a long way from not knowing the difference between a page and a post, but there is still so much I’d like to learn as the blog continues to change and grow. The growth of the blog has sparked meaningful friendships with readers and fellow bloggers - and eventually provided a community of awesome people who share the same passions and interests. And as I begin this new chapter of Catie Bee, I'm excited to connect with more Disney-goers, sushi-lovers, coffee-drinkers, DIY brides, travel enthusiasts, writers, artists, bloggers, and dreamers. It is a joy to share artwork + stories, and the support and response the blog receives means the world to me. To better organize posts, launch Catie Bee Art (online shop), and maintain the expansion of the blog, I've spent the past few weeks redesigning my little happy corner of the internet. Today, I get to finally share it with you! On the blog, you'll find posts on a variety of topics: buzz thoughts, Disney (Entertainment, vacation guides, style), artwork, travel, wedding tips, and more! Most of the posts you'll find are from the previous look, and I'll continue to add older, popular posts as well as create new content. If you're interested in submitting a guest post on one of the categories, feel free to contact me! My online art shop - Catie Bee Art! OPEN NOW, so check out!! Lots of original pieces for sale. Custom orders are always accepted. Visit the Portfolio page for artwork/gifts ideas for any occasion: anniversaries, weddings, birthdays, engagements, etc. Now accepting Christmas orders (hello, custom ornaments! ), so be sure to submit your orders! They book quickly. Of course - don't forget to subscribe to Catie Bee! You'll be the first to know about giveaways, artwork, new blog posts, and more! For more info about the bee + the blog, click here!